The National Institute of Neurological Disorders and Stroke and the National Center for Advancing Translational Sciences, part of the National Institutes of Health, have awarded University of Miami Miller School of Medicine neurologist Michael Benatar, M.D., Ph.D., a $6.24 million cooperative agreement award to establish a Rare Diseases Clinical Research Consortium that will study amyotrophic lateral sclerosis (ALS) and a group of related disorders. This consortium will be part of the Rare Diseases Clinical Research Network (RDCRN), an initiative of the Office of Rare Diseases Research. 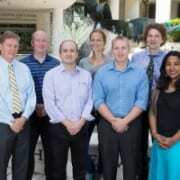 The consortium, which will be called CReATe (Clinical Research in ALS and related disorders for Therapeutic development), includes J. Paul Taylor, M.D., Ph.D., at St. Jude Children’s Hospital, as well as neurologists and scientists at the Mayo Clinic in Jacksonville, University of Kansas Medical Center, University of California San Diego, University of California San Francisco, Duke University, the Medical University of South Carolina and the University of Tübingen in Germany. Key UM partners in this initiative include Stephan Züchner, M.D., Ph.D., professor and interim Chair of the Dr. John T. Macdonald Foundation Department of Human Genetics, Jacob McCauley, Ph.D., associate professor of human genetics and Associate Director of the Center for Genome Technology at the John P. Hussman Institute for Human Genomics, Evadnie Rampersaud, Ph.D., research assistant professor of human genetics and Director of the Division of Genetic Epidemiology at the Hussman Institute, Rebecca Schüle, M.D., Joanne Wuu, Sc.M., research assistant professor of neurology, Zane Zeier, Ph.D., assistant professor of psychiatry and behavioral sciences, and Claes Wahlestedt, M.D., Ph.D., Vice Chair for Research, Leonard M. Miller Professor of Psychiatry and Behavioral Sciences, Associate Dean for Therapeutic Innovation, and Director of the Center for Therapeutic Innovation. disease that attacks the motor nerves, leading to progressive muscle weakness. There is no effective therapy for ALS and the lifespan for those affected is typically only three to five years. Operating under the five-year cooperative agreement award, the CReATe consortium will carefully evaluate the relationship between phenotype and genotype in this group of motor neuron and related disorders, search for novel genetic causes of disease, identify genetic modifiers, and advance development of biomarkers that may aid therapy development. In addition, the consortium has the goal of training and mentoring fellows and junior faculty in clinical research related to ALS and related disorders. A special and important aspect of CReATe is its partnership with a number of organizations that represent patients afflicted with this group of rare diseases. These include the ALS Association, the Muscular Dystrophy Association, the ALS Recovery Fund, the Spastic Paraplegia Foundation, the Association for Frontotemporal Degeneration, and the National ALS Registry and PatientsLikeMe. 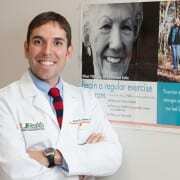 Alberto Ramos, M.D., M.S.P.H., assistant professor of clinical neurology and Co-Director of the Sleep Disorders Program, was a featured speaker at the 2014 Florida Society of Neurology Annual Meeting in Orlando. In his presentation, titled “Clinical Research in Sleep Disorders,” Ramos discussed recent basic, epidemiologic and clinical research in sleep medicine, how these concepts apply to cerebrovascular disease and dementia, and diagnostic and treatment strategies for patients with sleep disordered breathing and sleep deprivation. At the event, he also participated in an Advances in Neurology roundtable. University of Miami Miller School of Medicine psychologist Daniel Jimenez, Ph.D., assistant professor of psychiatry and behavioral sciences, has just kicked off a study that uses exercise and social engagement as a way to stem depression and anxiety among local Hispanic seniors. Using a small army of local health promoters or promotoras de salud, Jimenez will enroll 60 Hispanic seniors over age 60, who will take part in group exercise at local parks in Miami-Dade County. His hometown of Hialeah will be one of his first stops for recruitment. As part of the initiative, groups of six participants will meet three times per week for 16 weeks and perform 10 minutes of stretching and 30 minutes of moderately intense exercise. At the end of each session, the seniors will spend five minutes planning a future activity with a friend or family member, such as going to the movies or another enjoyable outing. “The idea is for them to keep the body active and keep their minds entertained,” said Jimenez, a Cuban-American who has studied mood disorders among Hispanics for the past seven years. The study, he said, is a novel way of addressing mental health, as it focuses on prevention instead of treatment. The four-year study is funded by a $670,000 National Institutes of Health grant. It’s Jimenez’s first major undertaking since joining the Miller School in June. Miami, he said, is fertile ground for studying mental health trends among Hispanic communities. But his study is also aimed at intervention and long-term mental health stability. “By the first two sessions, we hope to see a decrease in symptom severity. By the completion of the study, we hope to see a continued trend,” said Jimenez. Previous research, he says, has shown that Hispanic seniors in the U.S. have higher rates of depression than their white, non-Hispanic counterparts. Often times, Jimenez says, they feel socially isolated due to feelings of detachment from their homeland. And while Hispanic seniors share similar anxiety levels with non-Hispanic whites in the U.S., Jimenez explains, they are less likely to seek mental health treatment, which exacerbates the problem. Elderly Hispanics also have vastly different perceptions of their mental health and what causes the disorder. “You often hear ‘If we hadn’t left Cuba, my spouse wouldn’t have gotten Alzheimer’s.’” Denial and stigma, he says, are also barriers to treatment. Obesity, diabetes and cardiovascular ailments are additional risk factors for depression that are also prevalent among Hispanic seniors. The study targets seniors who have not yet crossed the threshold of clinical depression or anxiety but show some related symptoms and are identified as being at risk. Upon recruitment, participants will take a brief questionnaire that assesses their level of community involvement, social support, physical activity, ability to do activities and self-confidence. They will be reassessed with the same questionnaire after six months and a year later. “The goal is to intervene before the water really gets over their heads and they’re really depressed and not seeking treatment,” said Jimenez. For more information on the study, contact Dr. Daniel Jimenez at 305-355-9063 or dej18@med.miami.edu .